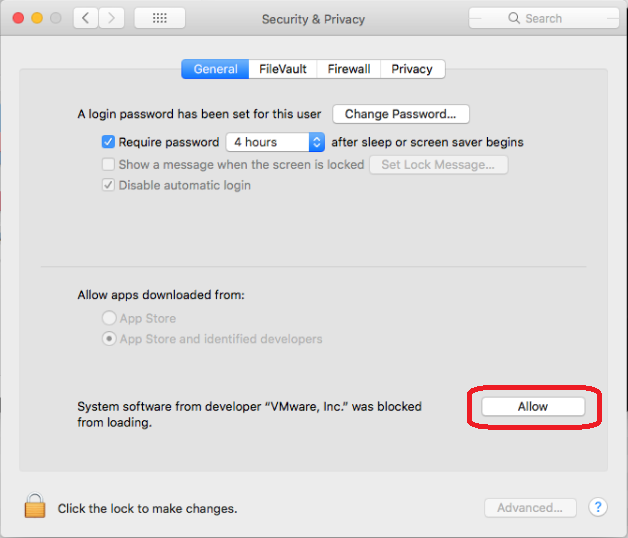 This is just a quick post about an issue you’ll see when installing VMware Fusion on macOS High Sierra. During the install the following screen pops up. As you’ll have to dismiss that screen for continuing I figured it might be helpful to give quick directions. Just select that one and you’ll get the screen that the popup was telling you about. Now click the Allow button here and you’re all set. In short: You can trigger the confirmation by moving the Fusion install to another folder -while using Finder- and then back into the Applications folder. After doing that rerun the installer to install VMware Fusion again. FYI, none of this worked for me. No matter how many times I reinstalled, moved the application, downgraded to a previous working version, etc, the “Allow” button never turned up in Security & Privacy and I continued to get the “Cannot find a valid peer process to connect to” error. What finally did work was completely disabling the “Kernel Extension User Consent”, as suggested by efengle here: https://communities.vmware.com/message/2713548#2713548. 3. In Terminal, check the status Kernel Extension User Consent via “spctl kext-consent status”. The output should say “ENABLED”. Obviously disabling security features is not the ideal solution, but for now it is the only thing that has worked for me, so I’ll take it. Hopefully it can help someone else as well. Hello “Argh” as you say that should not be needed. Was this with VMware Fusion 10 or with an earlier version? Earlier versions might require you to -at least temporary- disable kernel extension user consent. Apologies for the delayed reply. I had tried with many versions, including VMware Fusion 10.1.1.